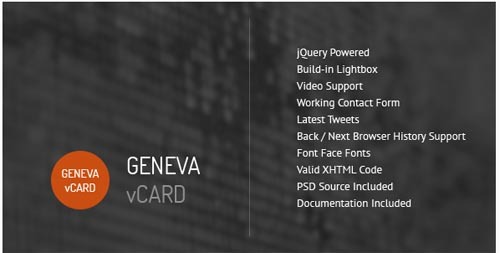 Geneva is a minimalistic personal or corporate vCard Template based on 9 tiles grid. Each single tile is a single page. The Template contains 9 pages including typical descriptive ones like about, services or testimonials. Portfolio pages with image and video support including build-in lightbox. Pricing page with pricing table and contact page with working contact form and map of location.